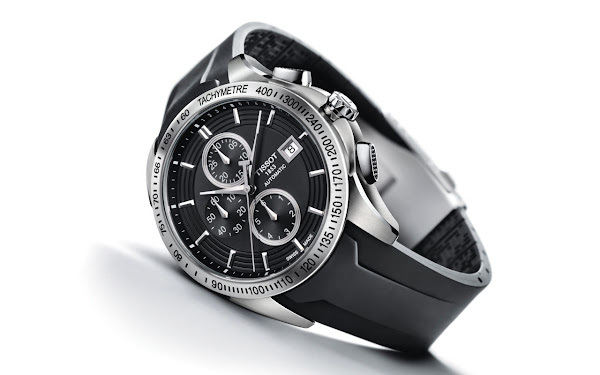 In the Tissot Veloci-T Gent, the revolutionary new chronograph movement, recently introduced by Tissot, meets elegant design with a sporty accent. A duo of models shares a black and silver colour scheme and sophisticated, speedometer-inspired looks. Two of the chronograph counters are framed with their own metal ‘circuit’ at 12 o’clock and 6 o’clock. The third one sits at nine o’clock to balance the date display surrounded by a retro TV-screen shape on the opposite side. These timepieces are geared to the needs and tastes of active wearers who frequently take the time to appreciate the essential things in life. 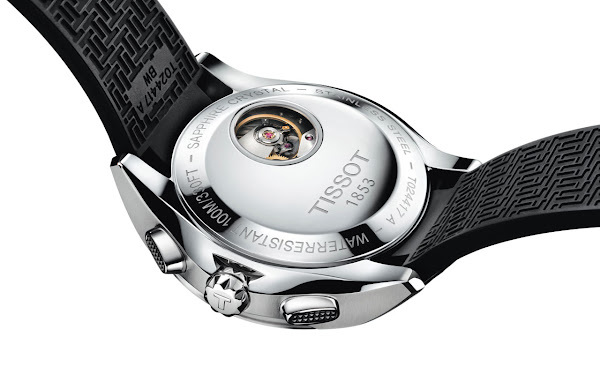 Safe in the knowledge that their watches contain a dynamic new movement, wearers of the Tissot Veloci-T Gent have different options for making a statement on their relationship with modernity. One model has a black rubber strap with a sculpted form. And all of its counters have a black background to complete the sleek overall look. Its counterpart integrates a metal bracelet. Two of the counters on this variation have silvery-white backgrounds. Either of the watches is completely at home in combination with anything from tailored business attire to urban sports gear.